Mounted to the back of the K9’s vest our new CORE K9 Camera transmits real-time HD video back to the handler. CORE K9 also includes Thermal Fusion Technology, allowing you to not only see thermal colors but also see clearly defined outlines of objects and persons. The “Push to Talk” feature allows handlers to easily communicate commands to the K9 or suspect, by simply pressing a button on the handlers wrist mounted monitor. The CORE K9 Camera also features a light sensitive camera and high output IR illuminator to provide enhanced vision in low light environments. The camera neck is spring loaded allowing dogs to maneuver through tight spaces or brush without being caught or held back by the camera arm. An internal DVR records audio and video directly to an SD card for post operation review and archiving. See what the dog sees from a distance and utilize the video recording capability for evidence collection and training purposes. 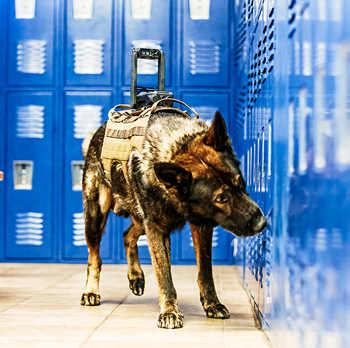 The CORE K9 Camera is ideal for military working dogs, Police K9, and Urban Search and Rescue K9 teams. Tactical Electronics provides wireless camera systems, IED training aids, EOD tools, and training to law enforcement and military agencies. For over a decade Tactical Electronics has been a reliable resource to lead law enforcement agencies and trend-setting military groups. Whether we are providing high-level electronics training or designing top-notch products, our goal is to deliver safety to those who protect us.